Ashton cigars founder Robert Levin has established himself as one of the most talented men in the industry when it comes to creating enjoyable masterpieces. He’s done it for us again and again, and this time – as one of the rarest cigars he has ever released – aficionados should immediately make room in their humidors for the Ashton Aged Maduro. Crafted with a perfectly-aged blend of Dominican long-leaf fillers, the Ashton Aged Maduro also features a Dominican binder to ensure consistency. Then, this beauty is wrapped in a dark, oily, slowly fermented maduro Connecticut Broadleaf. One of the rarest of its kind, the sleek wrapper looks just as savory as it tastes. When lit, the medium-bodied smoke combines notes of natural sweetness and subtle nutty undertones that captivate the palate with rich, delicious flavors. This beauty is hand rolled at the Château de la Fuente in the Dominican Republic to ensure authenticity. Many leaves are picked for production, yet very few are chosen for the Ashton Aged Maduro. 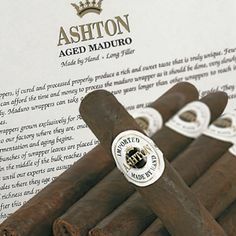 Ashton Aged Maduro is rare because of its selected and extremely limited Connecticut broad leaf wrapper. The initial sweet taste comes from the wrapper, but once lit, the cigar releases a richness and nutty intake. Ashton Aged Maduro’s rich distinct flavor comes from the never hurried natural fermentation of the wrapper, which encourages its natural sweetness. The wrapper and aged filler creates a rich and complex flavor elevating the Ashton Aged Maduro to a class all its own. It has a very pleasurable output from start to finish. An impressive cigar! Montecristo and Plasencia, a match made in heaven. The story of Montecristo Espada is seriously interesting. Not long ago, Montecristo and famed tobacco grower and cigar maker Nestor Plasencia struck a deal. This deal would gave Montecristo’s blending team, known as the ‘Grupo de Maestros,’ unrestricted access to Plasencia’s world-renowned collection of fine tobaccos and state of the art factory. At this facility, the Master’s went to work, spending months developing a flawless merger of fine, sophisticated cigar. What they discovered was a blend unlike any other. The Montecristo Espada overflows with flavor. A cigar that’s easily fitting of the Montecristo name, but with a level of flavor that’s both charming and inviting. The experience opens with a flavor and strength somewhere between their Classic and Platinum lines with some good spice and a note of raisin. Part way through 1/3, that raisin taste is joined by a delicious sweet cream, almost vanilla. It’s like berries and cream, but subtler, just enough to really get a good taste but not the syrupy sweetness of an infused cigar and combined with that typically delicious Monte tobacco flavor. The draw is absolutely perfect and produces a CONSTANT stream of smoke which I love! Monte fans should go ahead and buy a box! When I have the means, I know I will! In short, the Montecristo Espada is an exceptional cigar to add to your collection. judged over a period of time to be of the highest quality and outstanding of its kind. When people toss around the word classic, they are usually referring to a thing that will forever be cool and worth mentioning on a regular basis. For instance, I’m a nerd so classic items take on an entirely different meaning. In my case, a classic stands for something that will live on forever, such as the music by Journey or Michael Jackson or Star Wars – ya’ know – things that will actually last forever. Cigars are no different. Everyone has their favorite and there are many standouts, frontrunners, and even ones that can be deemed by many cigar aficionados as “classic.” The Arturo Fuente Hemingway Signature Perfecto is becoming one of those cigars. Arturo Fuente has created this mild-to-medium bodied cigar of flawless construction and perfect burn which pays homage to its namesake “The Old Man and the Sea” himself, Ernest Hemingway. This choice brand employs the distinctive “Hemingway Blend” created by Carlos Fuente in one of the most intricate cigar shapes: the perfecto (6 x 47). 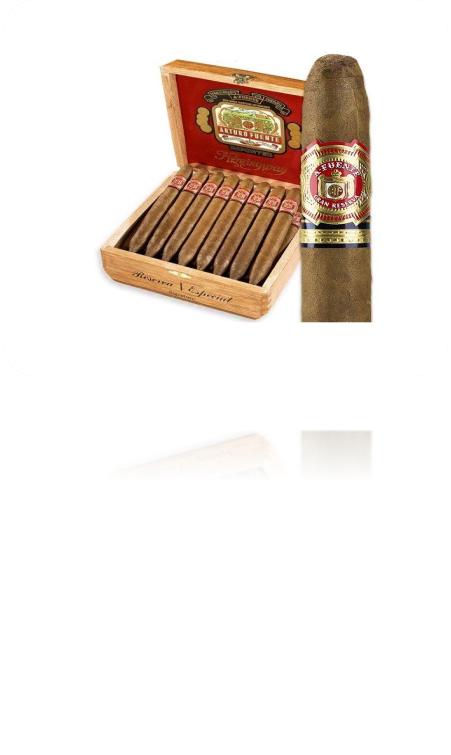 The Fuente Hemingway’s combination of painstakingly aged Dominican filler and binder encased in a select Cameroon wrapper produces dense clouds with a rich, pleasing aroma. I’ve read multiple rave reviews about the Hemingway Short Story, but I don’t like short, fat cigars. But I discovered the Signature, which is a perfecto size (you see what I did there?). Good construction with an immediate scorch; no struggle to start enjoying. The foot is twisted to a very small diameter opening, and it made it very easy to light. A single match is enough. I’m always pleasantly surprised when a cigar tastes good from the very first puff. The Hemingway has a very creamy smoke, a very even taste, and consistent throughout the whole cigar while maintaining an excellent taste to the end. 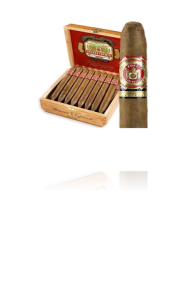 If you are searching for a top cigar with a classic finish, stop by and try an Arturo Fuente Hemingway! It’s so hard to say goodbye to yesterday. Although we are in Dallas Mavericks territory, it’s good sportsmanship to acknowledge the ol’ purple and gold. The Los Angeles Lakers lost a legendary player, Kobe Bryant, as he announced his retirement from the game he’s dedicated his entire life toward. If you know anything about basketball then you know that Bryant is a soon-to-be Hall of Famer. In the world of cigars it too takes a great team. A great brand requires experienced hands in both the field and the factory and mother nature to bring forth great climate. All these elements help to create a world-class cigar. If you haven’t tried an Aging Room cigars yet, it’s high time you made their acquaintance. Rumor is that these cigars are made in very limited batches of tobacco leaves too small for regular production. They are uniquely handmade and highly in demand. 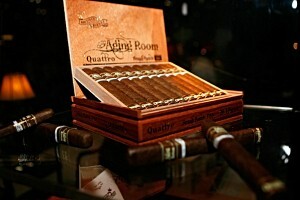 The Again Room cigar offers a medium smoke with a loose draw. You notice light nut and pepper notes from the first couple of hits but it transitions well into a more flavorful smoke a quarter of the way into the stick. Although non-Cuban oriented, the tobacco is Dominican and the wrapper derives from a 2003 Sumatra leaf. According to Cigar Aficionado Magazine, the Aging Room Quatro is “a Balance and Sophisticated cigar that display rich notes of roasted coffee bean and sweet cedar”. The Aging Room Quattro F55 was rated in Cigar Aficionado’s 10 Best Cigars of the year in 2013 naming the Aging Room Quattro F55 the No.1 cigar of the year. With that said, this small batch definitely made our list. Aging Room is a brand that you can’t really go wrong with. Undoubtedly, this cigar is in a league of it’s own.